The Atlanta Falcons Coach of the Week program recognizes high school football coaches across the state of Georgia for their hard work and dedication to making a difference in student-athletes’ lives on and off the field. Cedar Grove head coach Jimmy Smith is the fourth winner of the 2018 season and his Saints are currently ranked No. 2 in the Class AAA poll. 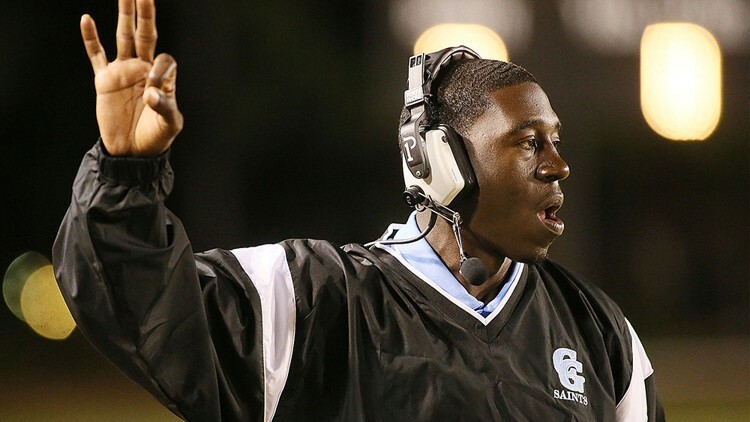 Cedar Grove improved to 4-1 last Friday with a 45-0 win over Lovett in its Region 5-AAA opener. The Saints defeated Hewitt-Trussville (AL) 34-30 in a nationally televised matchup earlier this year, and their lone loss came in a 24-17 battle with Class AAAAAAA seventh-ranked McEachern. Coach Smith led the Saints to the Class AAA state title in 2016 and the program’s first undefeated regular season since 1991 last year. In addition to turning Cedar Grove into a perennial powerhouse, Smith has prioritized community initiatives, including mentor programs, Youth Camps, SaintA Claus (which gives presents to the Elementary schoo) and DeKalb Community Clean Up Day. Smith advocates player safety as a member of Heads of Football and attends USA Football Clinics annually. His team does a tackling circuit every Tuesday to teach and promote proper tacking tackling techniques and the strength program emphasizes the importance of stretching and taking care of your body, even incorporating yoga into this summer’s training.